TMChoir performs a program of Handel and Haydn with orchestra and soloists at St. Andrew’s Church., under conductor David Fallis. Photo by Brian Summers. 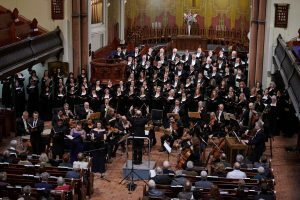 The Grammy-nominated Toronto Mendelssohn Choir, as one of Canada’s largest choral organizations, believes its role is to provide Canadian audiences the experience of the classical choral masterworks of the world. For a quick look at what goes into one TMC season check out this fun graphic, and here’s a map that highlights the international reach of TMC activities. Grand symphonic sound has been the Toronto Mendelssohn Choir’s trademark for over 125 years. Performing both sacred and secular repertoire, TMC choristers are committed to offering audiences authentic interpretation, clarity of expression and a profound emotional experience of some of the most important music ever composed. Concerts are exhilarating and uplifting celebrations of the triumphs, great and small, of the human spirit. Through its performances and educational programs, the Toronto Mendelssohn Choir aspires to make choral masterworks available, accessible, and inspirational to all listeners in order to create a shared heritage of musical expression and appreciation. The TMC includes a core of 20 professional singers. Currently this core is formed by 20 members of the Elora Singers. Starting in the 2019/20 season, the TMC will audition and retain its own professional core. The TMC organization also includes the Mendelssohn Singers, a 70-voice ensemble formed from the ranks of the TMC, giving us more flexibility in both performing venue and repertoire. The TMC is currently conducting an international search for a new artistic director who will be only the 8th artistic director in the Choir’s 125-year history.